Lumilor is a new artistic medium. There are many possibilities for how electroluminescent paint can be used in the artistic world. With a paint product that can now produce light, artists are opened up to many more design options and capabilities. Not only for lighting up cars and motorcycles, Lumilor can be used for a number of different applications. 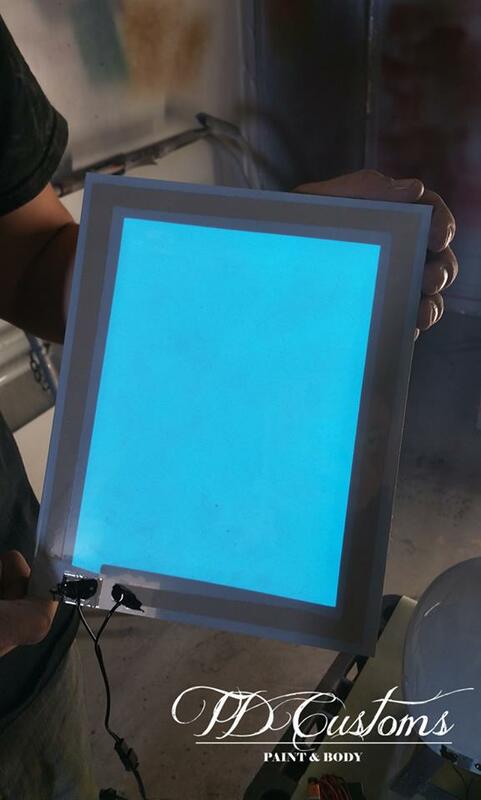 This project involves creating a simple electroluminescent painted panel for a local Asheville artist who will experiment with different top coat paints herself. Lumilor is a multi-layer coating system that is always sprayed as the base. From there, we paint additional colors and designs, or black areas out to create the look you want. You can paint on top of Lumilor with brush paints, an airbrush or your typical spray air gun technology. Light up paint also reacts differently with different top coat colors. As the light shines through, the top coat paints may change the color when it is lit. In this case, we put extra clear coat on top of the Lumilor because we know our local artist will be painting on top of it. With the extra clear, she can potentially paint something and wipe it off if she doesn’t like it, and thus experiment with how her process will work with electroluminescent paint. We are excited to see what she will come up with! It may just be a cool project for her to have fun with, or it could potentially be the start of a new type of art. I’m sure she will share what she does with it, so we’ll happily show that off too. If you’d like a lit up panel like this, or have another paint project in mind, contact us or fill out a Get Lit Request form for a quote. What will you paint with Lumilor? No Replies to "Lumilor: A new artistic medium"